NANAIMO, B.C. - The Trail Smoke Eaters scored three first period goals but surrendered the lead and eventually fell to the Nanaimo Clippers by a 4-3 score in a shootout on Sunday afternoon at the Frank Crane Arena. Kent Johnson scored a pair of first period goals while Michael Hagen earned his first career BCHL tally in a terrific opening period for the visitors before the Clippers worked their way back, tying the game in the 2nd period before going on to pick up a shootout victory. 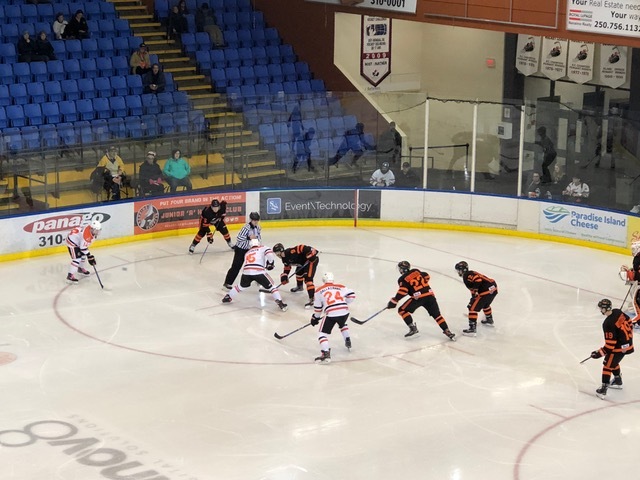 The Smoke Eaters started off the game on the right foot and opened the scoring as 15-year-old Kent Johnson gave Trail a 1-0 lead on the power play. Johnson walked the left goal line and cut to the front of the net, roofing a backhanded shot over the glove side of Nanaimo netminder Jordan Naylor for his 5th goal of the season at the 7:18 mark and gave the Smoke Eaters the lead. Trail jumped ahead by a 2-0 score at the 9:32 mark coming courtesy of affiliate player Michael Hagen collecting his first career BCHL goal. Hagen stripped the puck on the right side and centered in the slot for Tyler Ghirardosi, who had his shot stopped by Naylor but Hagen pushed the rebound past the glove side to extend the Trail advantage to 2-0. Johnson was at it again and increased Trail’s lead to 3-0 at the 17:10 mark of the opening frame on another power play as he tried to move the puck from his backhand to his forehand but had it bounce off a Clipper defender from the slot and past Naylor on the glove side. Johnson’s 6th and second goal of the night gave Trail a 3-0 lead before Nanaimo started their pushback. With just 36 remaining in the period, Nanaimo got on the board as Tyler Williams found a loose puck in front of the goal on a rebound and dragged from his forehand to his backhand and past Smoke Eaters netminder Adam Marcoux on the glove side to get the Clippers on the scoreboard and make it a 3-1 game before the 1st intermission. The Clippers scored twice in a 1:08 span to get the game tied, beginning with a nice passing play started from Danny Gatenby in his own end and passed to the bottom of the left face-off circle where Jonathan Stein corralled the puck and shot a pass to the glove side for MacKenzie Merriman who tapped in a power play goal on the glove side of Marcoux to cut Trail’s lead to 3-2. Nanaimo tied the game at the 8:12 mark with Stein winding his way through the defense on the left wing and beating Marcoux underneath of the glove side to get the Clippers back to even, working their way back from a three-goal deficit. The 3rd period was very much of a feeling out between the two teams and playing cautiously, not wanting to make a mistake. The frame saw Nanaimo lead in shots by a 9-6 margin but Trail still had the upper hand in the shots on goal department by a 33-23 count heading into the 3-on-3 overtime. The overtime session saw Trail dominate in the way of possession time and create the best chances with Braeden Tuck unable to capitalize on three good looks that kept the game going before Adam Marcoux came up with a breakaway stop on Merriman with 15 seconds remaining in the 4th period to force a shootout. In Trail’s first shootout of the season, Johnson scored a gorgeous goal, going on his forehand and zipped back to the backhand before coming back on the forehand again to slide the puck past the blocker side. Gunnar Wegleitner and MacKenzie Merriman scored in the shootout to help Nanaimo to the 4-3 victory. Adam Marcoux turned aside 23 of the 26 shots he faced in the game in the shootout defeat, his 4th loss of the season while Jordan Naylor stopped 35 of the 38 shots he faced in the game included two of the three shooters he faced in the shootout for his 1st win of the season. The Smoke Eaters (5-3-1-2) look to rebound on home ice as they return back to the Trail Memorial Centre for a pair of games beginning on Friday night against the Cowichan Valley Capitals (2-7-1-1). Puck drop is slated for 7:00 PM with tickets available for purchase at the Smoke Eaters Main Office.